In his best-selling autobiography, Albert Speer, Minister of Armaments and chief architect of Nazi Germany, repeatedly insisted he knew nothing of the genocidal crimes of Hitler’s Third Reich. In this revealing new biography, author Martin Kitchen disputes Speer’s lifelong assertions of ignorance and innocence, portraying a far darker figure who was deeply implicated in the appalling crimes committed by the regime he served so well. 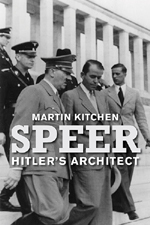 Kitchen reconstructs Speer’s life with what we now know, including information from valuable new sources that have come to light only in recent years, challenging the portrait presented by earlier biographers and by Speer himself of a cultured technocrat devoted to his country while completely uninvolved in Nazi politics and crimes. The result is the first truly serious accounting of the man, his beliefs, and his actions during one of the darkest epochs in modern history, not only countering Speer’s claims of non-culpability but also disputing the commonly held misconception that it was his unique genius alone that kept the German military armed and fighting long after its defeat was inevitable.